This is a comprehensive agreement that sets out the terms of business between an estate agent and property vendor for the sale of a residential property. The document includes practical matters, such as the use of "For Sale" boards as well as legal matters such as limitation of liability and indemnities. Use of plain English makes the document easy to edit and easy for your client to understand and accept. This template provides you with standard terms of business between your residential estate agency business and your property vendor client. 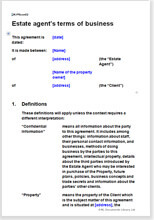 Broadly, the document clarifies the work you will do, the legal relationship between you as agent and your client, and the duties of your client to enable you to sell the property efficiently; and gives your business a greater degree of legal protection through limitation of your liability and indemnities. Of course, the document covers many other points as well such as confidentiality and severance. This document is a good example of where our use of plain English strengthens the document. Short sentences and jargon-free language make the template easy to edit. Your client is more likely to be happy to sign your terms if he understands them easily. And if a dispute should arise, it would be hard for your client to claim that he did not understand what he agreed when he signed. We also offer a letting agent agreement for agencies that let and manage residential property. If you have any questions about this document, or need further help, please contact us.